In September a new Sunday bus service was introduced to Saddleworth – the 355. This new service replaces the Sunday 353/354 service. 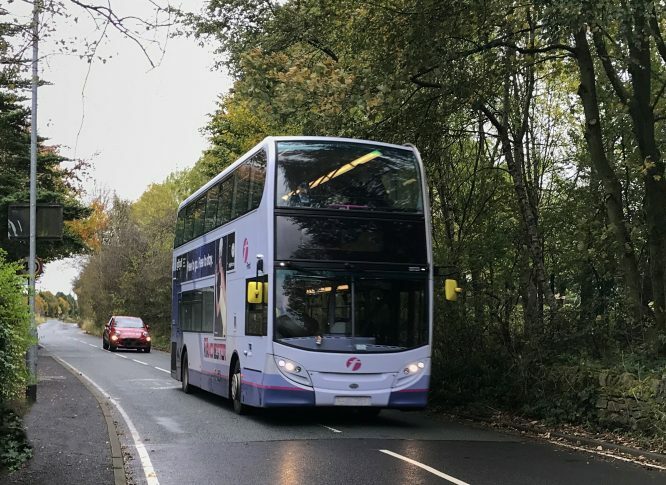 The 354 bus only ran from Ashton to Uppermill on Sundays meaning that residents of Dobcross, Delph and Denshaw were not able to use that service on Sundays. The 355 provides a direct link running from Denshaw through to Ashton. Running every two hours, the bus connects Denshaw, Dobcross and Delph. These villages previously had no Sunday service to Ashton and Denshaw had no Sunday service at all that connected with other parts of Saddleworth. This service is part of the work Transport for Greater Manchester (TfGM) are doing following the Saddleworth Transport Survey carried out last year. Other projects are currently being worked on that may be introduced in the future. The 355 is designed to provide a bus service and bus links that are not currently served, allowing direct journeys to people in Denshaw who otherwise would not have a direct bus to Ashton or any bus to Saddleworth. Furthermore it provides another option to people wanting to go to and from Delph and Dobcross on Sundays. The 353 and 354 are still running on Monday – Saturdays and the 355 provides a Sunday service that covers all the areas covered previously on Sundays as well as Denshaw.